St. Elizabeth of Hungary is an amazing saint! She can teach us all that earthly goods are not important in God’s eyes. St. Elizabeth of Hungary, also known as St. Elizabeth of Thuringia, was King Andrew II of Hungary’s daughter. While she could have indulged in an extravagant lifestyle, she chose a life of simplicity, sacrifice, service, and holiness. At age 14, she married Louis of Thuringia, who became king at age 18. They had three children together. He continued, “Once, on entering a church on the Feast of the Assumption, she took off her crown, laid it before the Crucifix and, covering her face, lay prostrate on the ground. “When her mother-in-law reprimanded her for this gesture, Elizabeth answered: “How can I, a wretched creature, continue to wear a crown of earthly dignity, when I see my King Jesus Christ crowned with thorns?”. “Among the Sayings of the four maids we find this testimony: “She did not eat any food before ascertaining that it came from her husband’s property or legitimate possessions. “Elizabeth diligently practiced works of mercy: she would give food and drink to those who knocked at her door, she procured clothing, paid debts, cared for the sick and buried the dead. “Coming down from her castle, she often visited the homes of the poor with her ladies-in-waiting, bringing them bread, meat, flour and other food. She distributed the food personally and attentively checked the clothing and mattresses of the poor. 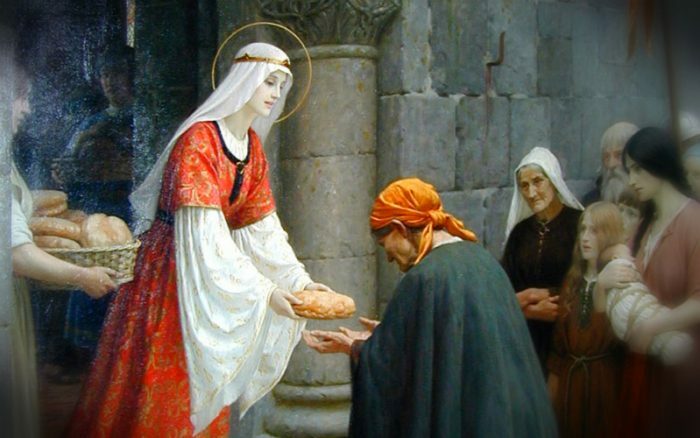 Pope Benedict XVI also spoke of the story of St. Elizabeth’s Miracle of Roses, in which the saint secretly took bread to the poor and hid it in her apron. After her husband died six years into their marriage, her in-laws treated her very badly and forced her out of the palace. However, she was reinstated after her husband’s allies from the Crusades returned, because her son was the rightful heir to the throne. St. Elizabeth eventually left the palace and became a Third Order Franciscan. She later founded a hospital in honor of St. Francis of Assisi. Here she devoted the rest of her life to serving the sick and the poor. St. Elizabeth died at the very young age of 23. During her lifetime, she exhibited such holiness that many miracles were attributed to her intercession almost immediately after her death. Pope Gregory IX canonized her in 1235, only four years after her death! St. Elizabeth of Hungary is the patroness of bakers, Catholic charities and the Secular Franciscan Order. Her feast day is Nov. 17. St. Elizabeth of Hungary, pray for us!